This country locally grows a variety of bright & colorful flowers. Orchids are native to Vietnam. Different types of Chrysanthemum (hoa cuc) are used on a very large scale as ornamental flowers. Peach Flower (hoa dao) being the symbol of the Vietnamese New Year. Lotus (hoa sen) is the Vietnamese symbol for summer. Gifting flowers in Vietnam is significant for building interpersonal relationships and has become a common occurrence throughout the country. Vietnamese will never miss sending flowers on occasions like birthdays, homecoming, anniversary, Tet holiday, etc. Other preferred gifts are tea, food, confectionery & fruits. Send flowers same day to Vietnam using our local florists & flower shops. Order by 12 noon. Send Mother's Day Pink Roses, Lilies, Carnations & Special Gifts to Vietnam. Send Roses, Carnations, Lilies throughout Vietnam for occasions like Birthdays, Anniversaries, Funerals, etc. Enjoy affordable flower delivery across Hanoi, Haiphong, Da Nang, Can Tho & nationwide delivery. How do i send International Flower Delivery to Vietnam? 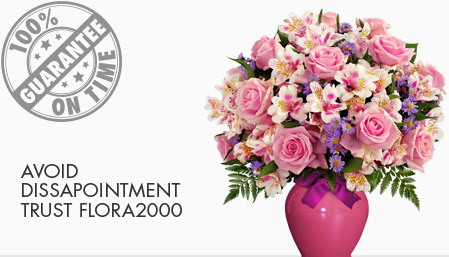 Flora2000 has transformed International flower delivery to Vietnam into a fine and effortless art. With our efficient flowers & gifs delivery services worldwide; you are sure to find the perfect expression of your message to your loved ones. Be it Roses, Lilies, Carnations or Cakes, our gifts are sure to make both the sender and the receiver happy. We make sure the gifts you give reflects what you feel about the receiver. Vietnam is land of production of many bright & colourful flowers. It has an appropriate climate which allows for some flowers to grow and bloom year round. Orchids are native to Vietnam. Different types of Chrysanthemum (hoa cuc) are used on very large scale as ornamental flowers. Peach Flower (hoa dao) is a symbol of the Vietnamese New Year. Lotus (hoa sen) is the Vietnamese symbol for summer. Giving gift is significant for building interpersonal relationships and has become a common occurrence throughout Vietnam. Vietnamese are very particular about their gifting to someone on occasions like , homecoming, anniversary, Tet holiday, etc. Preferred gifts are tea, food, confectionery, fruits, flowers, etc. However, knives or scissors are not appreciated as they imply separation. Handpicked Unique Gift Ideas for Mom. Fresh Roses, Lilies, Carnation & Gift Hampers specially crafted for your mum. Order NOW for guaranteed delivery on Mother’s day in Vietnam.